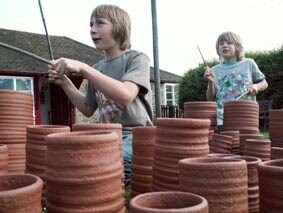 I spent the day last Monday being filmed for a short DVD to accompany my exhibition at Bilston Craft Museum. 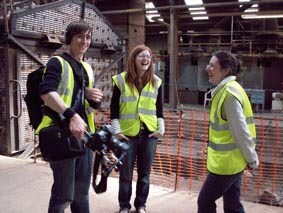 The production team, pictured left to right; Anthony (film-maker), Carrie and Natalie (Bilston Craft Gallery). It’s been a few weeks since I was last at the Brickworks. On my last visit, I left the largest completed vessel unwrapped to allow the bricks to dry and shrink. Quite a dramatic effect I think you’ll agree? I love the tones and colour displayed by the uneven drying – the darker bricks at the bottom are still quite damp whilst the ‘white’ ones at the top are nearly dry enough for firing. For some years now, the nature of my practice has been interpersonal – I’ve worked with participants of all ages and abilities, making things out of clay destined to be recycled rather than being fired. 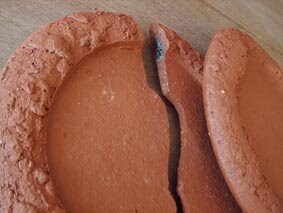 I was starkly and cruelly reminded this week of the potential for disaster when committing work to the kiln. I lifted the kiln lid to find all of the pieces…in pieces or severely cracked beyond repair – 2-3 days of work ruined in one foul swoop. You would think that twenty years plus of experience would render the firing of work a mundane and risk free activity…It’s anything but. There are so many variables to the process of firing; temperature, rate of temperature climb, size of the work, position in the kiln…I could go on. Just one small change – in this case the shape of the thrown form, and you can pretty much throw everything you know out of the window! Although I’ve been working with brick clay for the past three years, I’m still learning how it works…but when you have a deadline looming, the need to get it right is intensified. 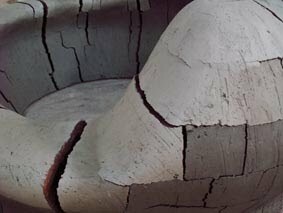 I had forgotten what a frustrating and destructive process transforming clay into ceramic could be. Those pieces that survive the rigours of the kiln are special and should not in any way be taken for granted – lots of ‘metaphor for life’ potential me thinks!